Gone are the days when cars looked simple and offered just a few catchy features. Today, we can alter our vehicles according to our needs and give them the look that we desire. This can be achieved by giving your car a paint job, and accessories, such as headlights. This is the era of technology and the cool looks. When it comes to cars, plain looking headlight bulbs are a no-no as they lack the flare and can make a car look dull. HID bulbs are quite popular in this regard as they can make your car look good, but they’re not the best option due to not being durable. Halogen lights on the other hand pack quite a punch since they are both eye catchy and extra bright. Moreover, they don’t cost much and have a long life with no headaches that most of the headlights come with. One such headlight is Sylvania 9007 SilverStar zXe headlight bulb. The Sylvania 9007 SilverStar zXe is said to mimic the intense white light of HID lights using a xenon bulb. Moreover, it is DOT approved 100% street legal. Sylvania SilverStar zXe Headlight Review – Road Test Video Watch Now! Sylvania has enforced the xenon halogen gas technology in this headlight bulb so as to give it a 3x times more brighter light compared to its rivals. The light bulbs are coated with a cobalt blue coating and when they strike the headlight mirror which is coated with top alloy, it gives off a jewel like appearance and makes it look more alluring. Moreover, its cobalt color, when combined with the xenon gas technology, generates a color temperature that is unique and very attractive. It is of vital importance to ensure that the brightness of your headlights stays sharp. As per Sylvania, halogen bulbs should be replaced after every 2 years because they begin to fade out with time. The headlights get dim due to degradation of the headlight lenses and UV rays have quite a role in doing so to the headlights. Hence, cars that run a great deal under the sun are more vulnerable to UV rays and as a result of which the headlight brightness can be degraded by up to 80%. While 2 years may not sound good enough to many, it is still better than most similar products on the market making this beauty worth a price. A common problem in case of headlights is for just one of the headlights to blow out. In case that happens, make sure to change both of them together to avoid having an uneven light projection on the road. Another reason for having a dim brightness is haze and corrosion around the headlight lenses. If the brightness of your car headlights seems to be fading away, then a Sylvania Headlight Restoration Kit can help a great deal in cleaning the lenses of the headlights and ensuring good brightness. Two of the most appealing and preferred headlight bulbs are the zXe and Ultra. While people think that there isn’t much of a difference between the two, the reality is a bit different. There is a 100k difference in the color output among the two as zXe has 4200k output while ultra has 4100k. Other than that, the beam pattern of zXe is much wider and goes further when compared to Ultra. As far as the light is concerned, zXe’s light is more crisp and whiter than the other. Choosing Vehicle/Part: The first step involves choosing the right bulb for your vehicle. You can search for the bulb that is compatible with the model of your vehicle here. Once done, proceed to the next step. Position Of The Bulb: Next, you will have to know the position of the bulb. Headlight high or low beam. Open the hood of the vehicle and prop it up. At the back of the headlight assembly should be a power connector, disconnect it. Remove the dust cover and see if there’s any clip hung around it, if there is, remove it gently, if found. Remove the bulb from the housing. Take your new bulb and fit in the socket but ensure that the glass part of the bulb doesn’t rub against anything but your hands. Replace the dust cover and clip as well, if there was any. Reconnect the power connector, and your bulb is replaced. Many people think that installing a headlight is a daunting process but it’s not. However, Sylvania recommends to use gloves and safety glasses because these bulbs are loaded with pressurized gas which can do bodily harm if proper care is not taken. Now, most of the headlight bulbs will come off by rotating them counter clockwise. If it doesn’t rotates, look for a safety tab and turn it down to make the bulb rotate. While removing the bulb, do not touch the glass part, try to keep your hands on the plastic part. If the headlight plugs look very dirty, use some electronic cleaner to give it a cleaning. Leave it to dry and add dielectric grease to improve lubrication, insolation and the rubber parts of the connector. Now, pass the bulb into the wiring connector with extreme caution and ensure that it makes a clicking sound, implying to fit properly. This needs to be done correctly or else the bulb will fall out due to vibration and the vehicle will lose headlight power. Next, pass the light bulb at the back of the headlight and keep rotating clockwise until it makes a clicking sound and it’s done. Still confused? watch this video now. LIGHTS DIM OVER TIME, REPLACE IN PAIRS: Your lights are a pair, one is never turned on without the other. If one bulb burns out, the other isn't far behind. Replace your 9007 SilverStar zXe bulbs in pairs for optimum performance. XENON CHARGED LIGHT BULBS: Cobalt blue coating provides optimal light transmission and color. Proprietary Xenon halogen gas technology. SLEEK STYLE MEETS PREMIUM PEFORMANCE: Silver mirror top alloy coating completes the jewel-like appearance of the headlights. 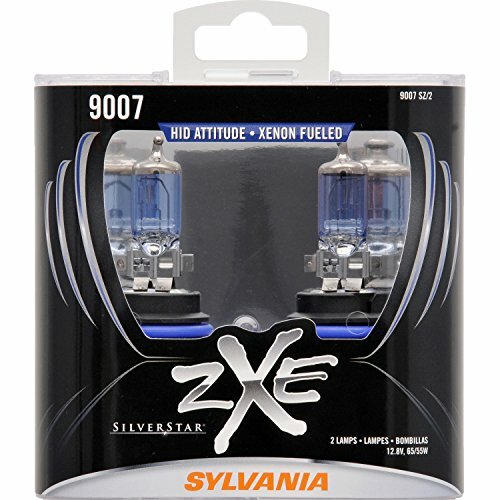 These 9007 SilverStar zXe bulbs provide crisp, white light - the look, feel and attitude of HID. 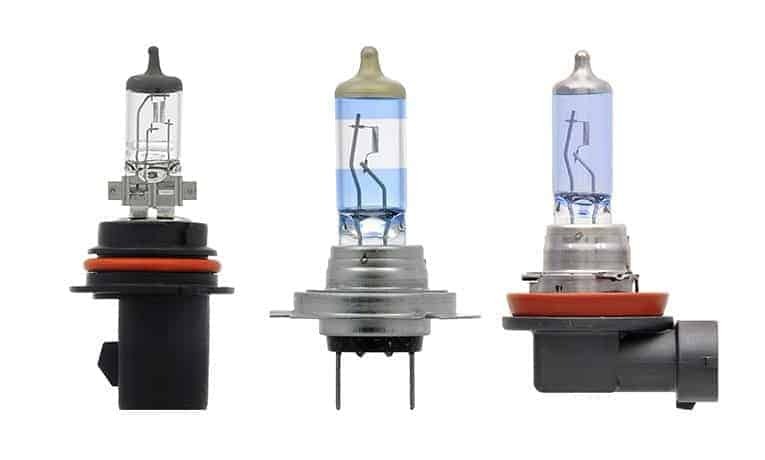 SUPERIOR HID ALTERNATIVE FOR MORE ATTITUDE: Proprietary Xenon halogen gas technology that makes these bulbs the best alternative and value compared to dropping in HID upgrades. DOT Compliant and 100% Street Legal. THE SYLVANIA STANDARD OF QUALITY: With 100+ years in business, Sylvania is the world leader in automotive lighting for Original Equipment Manufacturers (OEMs) and the aftermarket. Do you get warranty on these lights? Yes you do. The lights comes with a 1 year warranty. Are these lights worth a purchase if you have daytime headlights rule in your country or state? We can totally understand your concern. Running these headlights in daytime will make them give out soon is what you’re thinking. But worry not, they tend to last for 2 years even when you use them throughout the day. Is the light reliable when it’s raining heavily? It sure is. The clarity compared to the rival lights is mesmerizing. What cars do they fit? Numerous. To know if they will fit your car, check out on this website. Will they accommodate in fog lights? Sadly no. They are only made to fit larger housings. 55/65 – 55 when low beams are on and 65 when high beams are on. In the world of headlight bulbs, Sylvania Silverstar zXe Headlight is one of the most affordable and viable options you can go for.